Stradivarius are stringed instruments (such as violins, cellos, guitars and harps) which were built by the members of Stradivari family, especially by Antonio Stradivari. Stradivarius, as well as the colloquial "Strad" are often used to refer to their instruments. 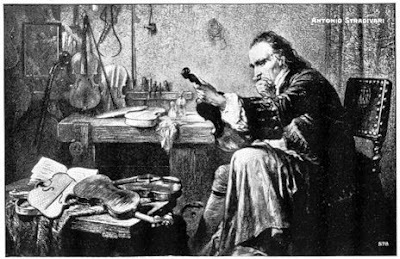 Antonio Stradivari is believed to have been born in the year 1644, although his exact birth date is not documented. He was born in Italy to Alessandro Stradivari and Anna née Moroni. It is possible that in the years 1667 through 1679 he served as a pupil in workshops of Nicolò Amati, though there is much evidence to dispute this fact. 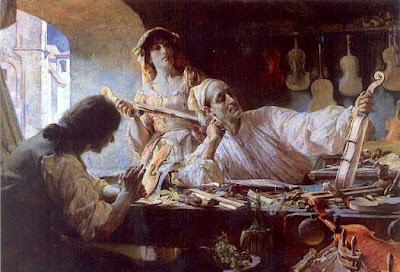 In 1680 Stradivari settled himself in the Piazza San Domenico, Cremona, and his fame as an instrument-maker was soon established thereafter. His originality began to show through his alterations of Amati's models. The arching was changed, the various degrees of thickness in the wood were more exactly determined, the formation of the scroll was altered, and the varnish was more highly coloured. It is generally acknowledged that his finest instruments were manufactured from 1698 to 1725 (peaking around 1715), exceeding in quality to those manufactured between 1725 and 1730. After 1730, some of the instruments are signed Sotto la Desciplina d'Antonio Stradivari F. in Cremona and were probably made by his sons, Omobono and Francesco. Stradivari's instruments are regarded as amongst the finest stringed instruments ever created. They are highly prized and still played by professionals today. Only one other maker, Joseph Guarneri del Gesù, commanded the same respect among violinists. Fashions in music, as in other things, have changed over the centuries, and the accepted supremacy of Stradivari's and del Gesù's instruments is only true today. In the past, instruments by Nicolò Amati and Jacob Stainer were preferred for their subtle sweetness of tone. A Stradivarius made in the 1680s or during Stradivari's Brescian period form 1690-1700, could be worth several hundred thousand dollars or more at today's prices in auction. If made during Stradivari's "golden period" from 1700 to 1720, depending on condition, the instrument can be worth several million. They rarely come up for sale and the highest price paid for a Stradivarius (or any musical instrument) at public auction was the Hammer, made in 1707, which sold for US$3,544,000 on May 16, 2006.